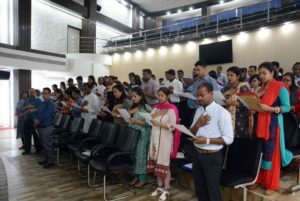 The PhD Coursework 2019 began on 25th March with an inaugural ceremony held at the auditorium of Academic Block I, Tapesia Campus. 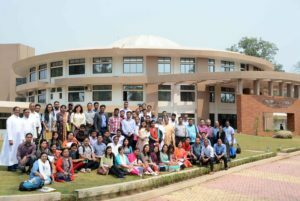 Welcoming the Research Scholars, Prof. JN Vishwakarma, Director of Research informed that 66 research scholars have been admitted to the Doctoral Studies this year, in 23 thrust areas. 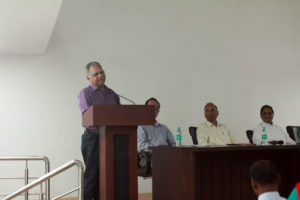 At the Inaugural Session, Prof Pawan Sharma, DBT Research Professor gave the Keynote Address. 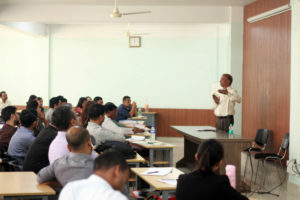 He advised the students, ‘to learn to deal things rationally and collaborate with people even with the ones you are competing with’ and ‘argue with the content of existing knowledge and actual observations, and never allow yourself to be limited by the lack of facilities – learn to make the best use of what is available in your hands”. 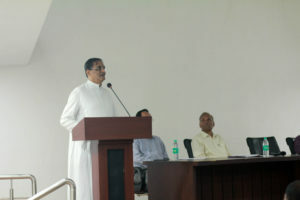 Dr. Peter Paul Hauhnar, the Development Officer administered oath taking for the students. The PhD Coursework will go on for 6 months, at the end of which there will be presentations and written examination.